There is no photograph, no newspaper clipping, not even an official scorecard of the match in which Kagiso Rabada first showed he was the real deal. There is only his father's memory. 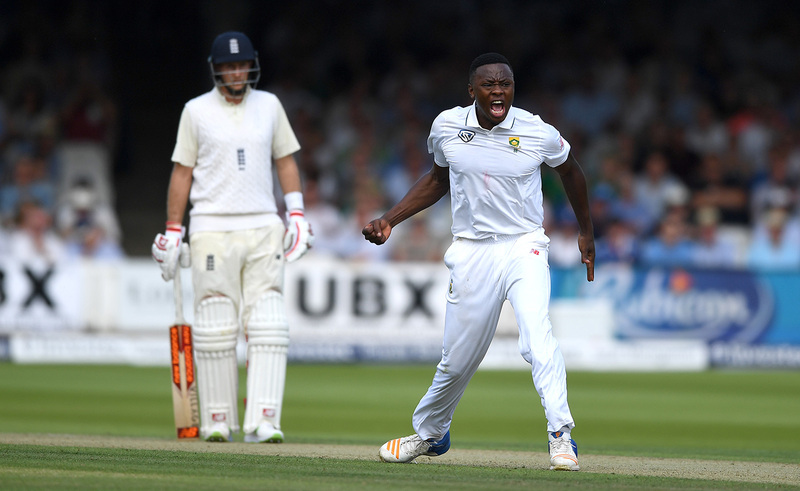 "Kagiso was 14 years old and playing in a time-cricket match at school, and his team were struggling to take the last wicket," Dr Mpho Rabada remembers. "He was given the ball. He ran in and bowled the fastest delivery I had ever seen at that point. The stumps went cartwheeling and his team won. It was a stunning moment, the best I'd seen." And Mpho Rabada had seen many. He had the privilege of being able to attend what he has calculated as "around 90%" of Kagiso's matches between the ages of 14 and 18, a luxury he knows few other parents could afford. "It's tough for parents, especially black parents, because often it is impossible to go to the ground when your child is playing. Not only is it costly but then there is the issue of taking leave from work as well. I thank God that I was able to go to so many games." Mpho mentioned his race because little in South Africa can be discussed without it, so let's get that out of the way early. Twenty-three years after apartheid, the country has moved on from the cute and cuddly phase of the rainbow nation, through the difficulties of a teenage democracy, and is really, truly trying to find itself. The Born-Frees, as those who came into this world after 1994 are known, are now young adults entering the job market. Theoretically, they should have many more opportunities than their parents did. Realistically, life has not changed enough for many of them. South Africa's majority black African population still account for most of the 30.4 million people living below the bread line and experience the highest levels of income inequality, according to Statistics South Africa. Transformation is a word that has become commonplace in everyday South African conversations and not always in a good way, but it is a necessary policy. In the commercial arena, Broad-Based Black Economic Empowerment is legislated. In sport, transformation through targets (or quotas) has a chequered history. In the mid-'90s, Cricket South Africa had a policy to field four "players of colour", an umbrella term that incorporates all "non-white" players, in each domestic and national team. By the mid-2000s, this policy was no longer official at national level, though it always lurked as a requirement that sort-of-needed-to-be-met-sometimes. Between 1991 and the end of the 2009-10 summer, South Africa handed out 72 Test caps, of which only 15 went to players of colour, and of those only three to black African players. Only one of those black African players, Makhaya Ntini, played more than six Tests. Between early 2010 and mid-2014, 11 more players were capped, of whom five were of colour. Only one among those was black African, Lonwabo Tsotsobe, who played the last of his five Tests in January 2011. Between then and December 2014, the Test team did not feature a single black African. Given that almost 80% of South Africa's population is black African and the number of black African players in schools has increased steadily since the mid-1990s, it was clear the system was flawed and CSA sought to fix it. Now South Africa's senior side must field a minimum average of six players of colour, including two black Africans, over the course of a season. It was under this system that Kagiso Rabada emerged, and so it seems fitting that he is celebrated as a poster child of transformation. Not so. This is why. Kagiso was born to Mpho and Florence in 1995 and spent his early years between Mamelodi, a township 20km east of Pretoria, and Johannesburg's West Rand. He spent his first three years living mostly with his paternal grandparents, a cultural tradition, but also an arrangement that allowed his parents to study further. Mpho pursued medicine, Florence law, and when they qualified and found employment, the family moved to Bryanston, a plush suburb to the north of Johannesburg. They were on their way up the class ladder, but not all of their extended family followed. Since they had regular interactions with relatives who had remained in the townships, Kagiso began to understand the difference between the haves and have-nots. He also knew which category he fell into. "I saw that my parents worked quite hard and then achieved a lot, so I didn't feel like at any time I struggled," Kagiso says. "At the same time, I knew what it was like for people to struggle. "When I was young, I used to love going to visit family but I didn't really notice how bad the conditions were. The older you get, that's when you really realise that it's actually quite hard. But those people are used to it. When you are used to something big and you go to something small, you will notice a difference." Essentially, he lived between two worlds - even three, because of the school he attended. Bryanston Parallel Medium School is an institution that teaches in English and Afrikaans, but not in any of the country's other nine official languages. That was where Kagiso's interest in sport began - but not in the way you might think. The first team sport he played was rugby, traditionally seen as a white, Afrikaans pursuit and a game Rabada senior was concerned would cause his son an injury. Though the young boys played barefoot, it was still a contact sport and Rabada was as eager as anyone to get involved. "I just loved the adrenaline," he remembers. "I tried to get into every ruck and tried to tackle everyone." It was only at the end of winter that cricket came into the picture. "Rugby season ended and I was passing a rugby ball around on the first day of cricket practice in my school uniform when a friend of mine came running down, saying, 'Mr Smit wants you to try cricket.' I thought, 'Let's go give it a shot.'" He turned out to be quite good. He was naturally athletic with sound ball skills. Yet cricket was only a stopgap until the next rugby season. "I didn't learn a lot of skill necessarily," Rabada says of his early days in sport, "like how to pass a rugby ball properly. I feel like I just did it, in rugby and cricket. I didn't think too much about the technical side of things. I played a lot on instinct and that was my downfall." As he neared the end of primary school, he failed to achieve a major goal. "I made the Under-13 B Gauteng cricket team. I didn't make the A team, and I remember I didn't like that fact because that year I also didn't make the Golden Lions Rugby team. I am very competitive with myself but I am also very honest with myself, and I knew I didn't deserve to make it." After those twin disappointments, rugby "started fizzling out". But Kagiso still had ambition in cricket. He earned a sports scholarship to St Stithians, a private school that he would have attended anyway because his family had the means. In Grade 10, when he opted out of rugby altogether to concentrate on cricket, his father was not unhappy. "We saw that his cricket was miles ahead. On a balance of probability, I thought there was a 10% chance of him playing rugby for the Springboks and 90% chance of getting injured, but I thought there was a 90% chance he would play for the Proteas." By then, Rabada had decided for himself that he wanted to play international sport, and saw that cricket was the code he was likeliest to advance in. He was picked in several age-group provincial sides and began ticking the boxes on the road to national selection. The only one he left unchecked was academics. Barry Lambson, the former international umpire and a long-serving teacher at St Stithians, remembered numerous occasions where Rabada had to miss classes to go on a cricket tour or could not complete his assignments because he was otherwise occupied. Mpho found it "frustrating" that his son did not take his books more seriously because "I still believe education makes you more rounded". Rabada simply could not muster the motivation to provide it. "I did just okay. My parents were all about academics but I didn't like it." If this all sounds fairly conventional, that's because it is. 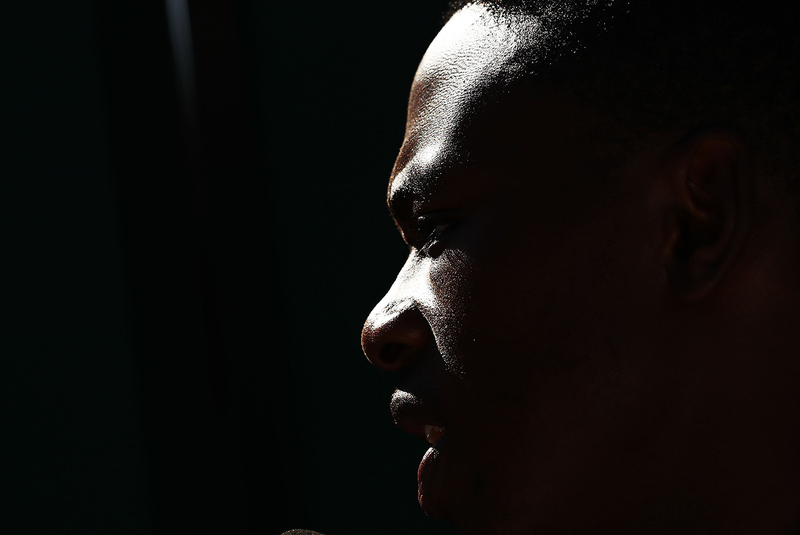 Both Rabada and his father describe his childhood as "normal". Rabada watched movies at the local mall, hung out with friends, avoided mathematics and science, and loved playing sport. Perhaps the only people who would be surprised about the way he grew up is the massive majority of South Africans referred to earlier, those who had not become doctors and lawyers, who had not moved to the suburbs, and whose children did not go to elite institutions. What made Rabada different to them was that, in Mpho's words, "Kagiso had everything". If "everything" had a measure, it would equal 6 for 25. Those were Rabada's figures against Australia in the semi-final of the U-19 World Cup in 2014 - figures that took his name beyond the borders of Bryanston and into the national consciousness. South Africa U-19s went on to lift the trophy, and Rabada was the joint second-highest wicket-taker in the tournament and his side's top bowler. When the team returned home from the UAE, they were flown to Newlands, where South Africa were playing Australia in the final Test of a three-match series. The U-19s enjoyed a lap of honour at the tea interval and had a mini press conference, in which the captain, Aiden Markram, and the coach, Ray Jennings, spoke while the rest stood around wide-eyed. 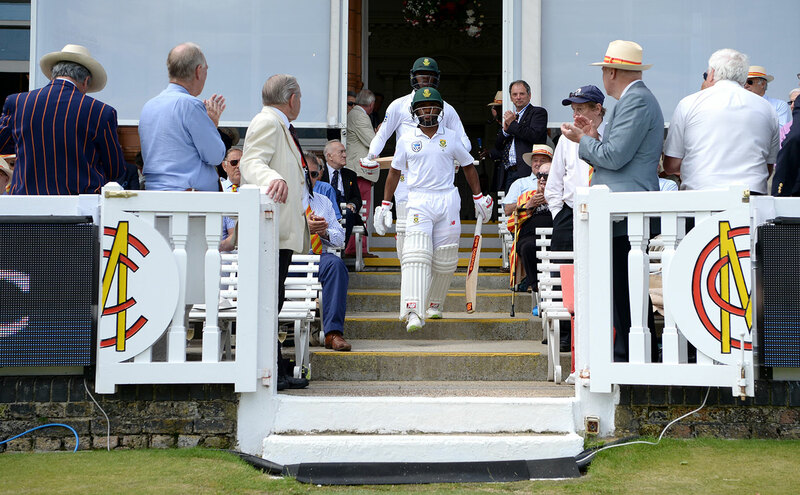 The only one who looked completely unimpressed with the whole shebang was Rabada. He brooded over the media box, all 1.91 metres of him, with a look that said, "I am intimidating." His gaze was trained to the windows, where play had resumed and South Africa were struggling. Mitchell Johnson and Ryan Harris were wreaking havoc and Rabada was enchanted. Though some journalists had hoped to get an interview with him, it was obvious he was otherwise occupied. It was also obvious that he was respected. Some of his team-mates gave away the fact that Rabada was the only one of them to have been awarded a franchise contract immediately on arriving home. 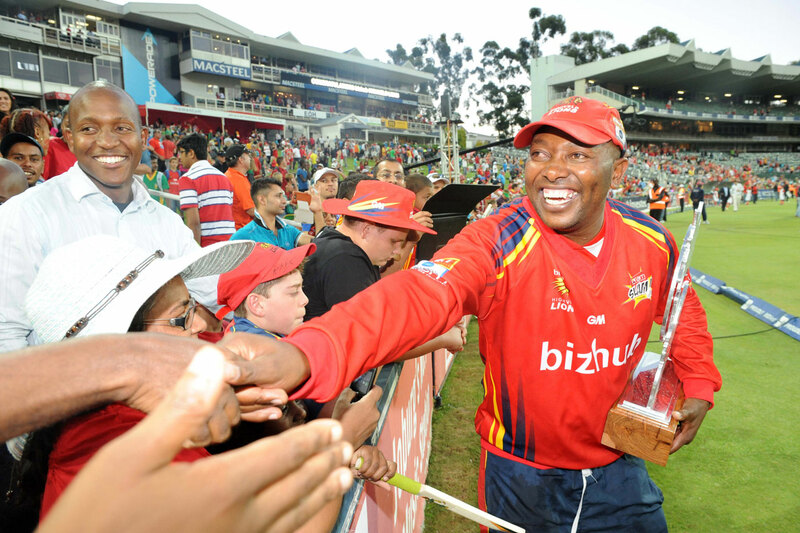 Before the month was out, he had turned out for the Highveld Lions. And five months later, in August, he was already onto the next step, travelling with South Africa A to Australia for two unofficial Tests and a 50-over quadrangular. Rabada's results on that tour were not spectacular - three wickets at 31.66 in one four-day game and four wickets at 58.25 in five 50-over matches - but the national coaching staff had seen enough in him. He was included as a non-playing member for a 50-over triangular tournament in Zimbabwe ahead of the 2015 World Cup. "We decided to take him with us just to get him used to the environment and for him to work with the coaches and get to know the players," says Russell Domingo, the national coach at the time. "But when we saw him in the nets, we were really tempted to play him in some of the matches." Domingo could not go as far as capping Rabada, because he needed the permission of the selectors. He had to wait more than a year to get his wish. The wait was worth it because in those 12 months Rabada's game developed significantly as a Lions regular. Under Geoffrey Toyana, the first black African coach in the franchise system, Rabada was encouraged to take on a leadership role in an attack that already had several experienced players. 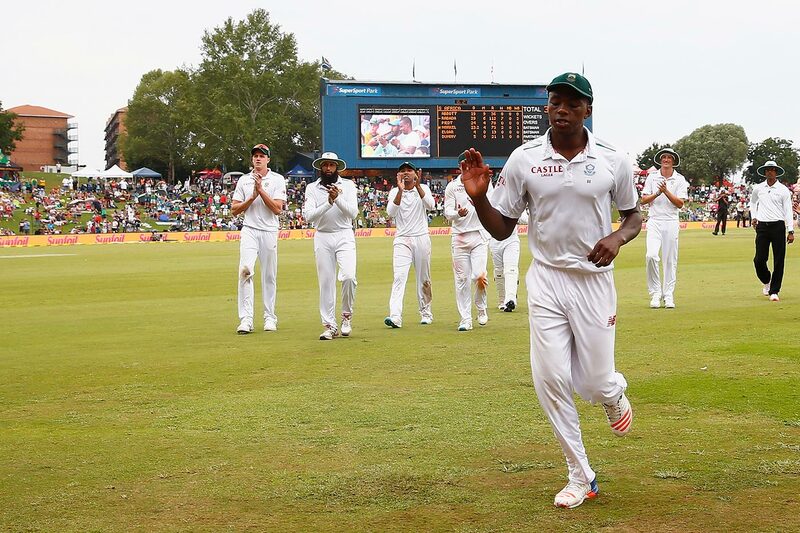 "It was a very good year for me to go into the Lions because we were just winning," Rabada remembers. "We won the first-class competition with record points. But it wasn't just about that. It was also about being around experience - people like Neil McKenzie and Stephen Cook - and getting to know the other players. I became friends with Temba Bavuma and Eddie Leie, and got to see what the life of a cricketer is like. And working under Geoff was very good for me, because he is such a good person, he manages people very well. It wasn't just about the cricket, we had so much fun as well." Toyana gushed every time he spoke about Rabada that summer - whether it was to praise his smooth action or to laud his control at pace. But he also asked the national selectors to be cautious, concerned that his young gun would be fast-tracked and over-exposed too soon. Yet by November that year, Rabada had made his T20I debut in Australia. "I said [to myself], 'It's your first game, let it rip and have fun,'" Rabada says of his first international game. He went wicketless in three overs, but he tried everything. He bowled full, back of a length, and short. He tried to find movement, he ran in full steam, he took pace off the ball, and he had a blast. In the next match, he earned his first international wicket: Glenn Maxwell caught at backward point. And that was that. He returned home. While the senior side prepared for what they hoped would be a title run in the World Cup, Rabada busied himself with trying to win domestic accolades for Lions. Against Dolphins in February 2015, he broke the franchise record for the best match figures with 14 for 105, five runs fewer than Dale Steyn's 14 for 110 seven seasons earlier. There weren't that many people in attendance at the Wanderers, but Mpho was among them. 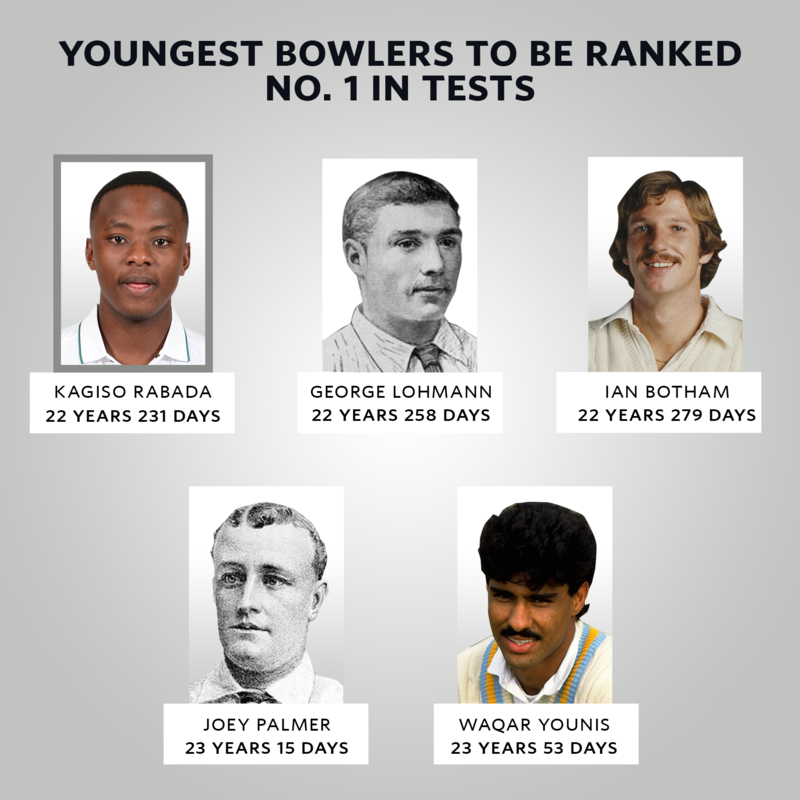 As Lions lifted the first-class trophy, Rabada finished joint second on the wicket-takers' list, with 39 at 21.12. All this becomes important because it was a time of immense reflection for South African cricket. The defeat to New Zealand in the 2015 World Cup semi-final was much more than a heartbreaking loss, it was a match tainted with political interference. It was revealed that a half-fit Vernon Philander was included ahead of the in-form Kyle Abbott after CSA reminded the touring party of their transformation obligations. In the aftermath, South African cricket seemed irreparably damaged. Trust between the players and the people who run the game had been broken. One of the gravest consequences was Abbott signing a Kolpak deal two years later. A sadness had settled on the players. AB de Villiers, in particular, seemed to have lost the heart to carry on, especially as his priorities changed with the arrival of his first child. Something needed to shift and introducing fresh faces was one way to start rebuilding. South Africa's winter tour to Bangladesh was the first opportunity to begin anew and several new names were included in the touring party. Rabada was the player to watch, and he lived up to the hype with the best ever ODI figures by a debutant: 6 for 16, which included a hat-trick in his second over. South Africa won that match but lost the series. Four months later they won a compelling ODI series in India 3-2, in which Rabada and Steyn were the joint leading wicket-takers. They were then completely decimated in the four Tests on raging turners. That series was the start of a summer of absolute discontent for South Africa. Their main bowlers - Morne Morkel, Steyn and Philander - were all injured at some point. In the mess, Rabada emerged as the only light. He concedes those were difficult days, made doubly so as he tried to reconcile the excitement of his own achievement (a Test cap at 20) with the hardships of the team. "First I will say, what a place to make a Test debut," he says about that India series. "The electric vibe. I will never forget that tour. Even though we lost, it was an experience. It was very hard but what you can you do? We tried our best. Those conditions were ridiculous. It was a very difficult mental challenge, trying to figure out why we weren't winning. For me, it was a crazy experience. Sometimes you learn the most when you lose." South Africa returned home demoralised and in disarray, with de Villiers' future uncertain, Domingo's head on a block, and a determined England on the way. Things went from bad to worse to worst when South Africa lost in Durban and Johannesburg to England, and Steyn went down again. Again, it was Rabada who provided a glimmer of hope. His 13 for 144 in the consolation win, in Centurion, came close to beating Ntini's 13 for 132 as the best match haul by a South African. Though the 2015-16 summer provided little to celebrate, he still walked away with six prizes at CSA's annual awards - the most by any player in the history of the event. There is no photograph, no newspaper clipping and no need for a scorecard to measure the kind of person Kagiso Rabada is becoming. There is only a memory. Two days after the 2017 CSA Awards, where he only won one award, he was on a flight from Johannesburg to Cape Town for a promotional event. He was travelling economy class, with small hand luggage and a book in his hand - Yuval Noah Harari's Sapiens: A Brief History of Humankind, which had been recommended to him by Rahul Dravid. Not exactly light reading but an indication of Rabada's curiosity, something his parents always wanted to fuel. "I am starting to get an interest in academics," he says. "I have considered studying but I haven't put my mind to it yet. I am interested in the science part of things - things like engineering. I don't know anything about it but I am just fascinated to know how people do things." That includes how he does things - things like bowling. Rabada now finds himself more interested in technicalities and spends more time with the video analyst and in the nets, honing his craft rather than being content with his natural ability. "I feel like I am learning about actions, learning about batting, fielding… I want to learn to bowl on different pitches, bowl to different batsmen, what skills sets you need on particular pitches, but I am just trying to bowl any ball at will, really." Already he is known for his aggressive use of the bouncer, and the execution of the yorker in the early stages of an ODI, which Domingo said gave South Africa "a lot of big breakthroughs upfront". Now Rabada wants to add variety. "I am bowling the legcutter a lot more, which I feel is a very effective weapon for me. To the left-hander, the offcutter is a very good ball to bowl, if it's gripping. I am specific in training but I try and do the simple things. I look at things like if I can I control my length. I practise the straight yorker and the wide yorker and to be really skillfully advanced, I would like to swing it while bowling a yorker - an inswinging yorker. I can get that sometimes to the left-hander but I would love to get it to the right-hander." Like any South African quick, his preference is to operate on green tops, but he says that "it's nice to bowl on pitches that grip. I feel it's nice because you can use your cutters and you can use your pace as well and the reverse swing comes in as well." Among the swing bowlers he admires are Mitchell Starc and James Anderson, who have "lovely actions" - and of course, South Africa's own Steyn. In a perfect world, the pair would be operating together. In the realistic one, Rabada will succeed Steyn as the leader of the attack. He has seen Steyn leave the field in Mohali, Durban, Perth and Cape Town, Morkel in Potchestroom, Philander in London. He has himself been injury-free so far, something his doctor father puts down to knowledge and a natural athleticism. "I talk to him a lot about the theory of motion and how things work," says Mpho, "but I am also the kind of parent that tells my kids about philosophies and then it's up to them to apply that." Rabada says he has developed a "feel" for when he is in good rhythm and when he may be at risk of tweaking something. He has also developed that sense about his on-field persona and knows when to turn on the nasty. Most often it is only with a stare, but occasionally he says something, as he did to Ben Stokes at Lord's last summer. Though it earned him a suspension, his captain, Faf du Plessis, told Rabada not to change, but to be a bit more careful. "As a bowler, you have to have that thing," Rabada says, "where you have to sometimes chirp, and I do chirp. A lot of bowlers did that. If you look at the greats, they all did that but most of the time I try to let the ball talk and not my mouth. Here and there I will say the odd thing, but I am definitely aggressive as a player. I try and read the situations, which is why tactically I feel I am getting much better." As for Stokes, Rabada describes their relationship off the field as "chilled". He is friends too with a player so many fans love to hate, Stuart Broad, and with Sam Billings, a team-mate at Kent and Delhi Daredevils in the IPL. He sees the IPL as "an opportunity, just to go and have fun. Obviously to play well but you also want to set up your future at the IPL. I love playing in India. It's such a fascinating place to play, and playing against the world's best players, mixing with the players, it's a whole different experience." In the 2017 auction, Rabada sold for Rs 5 crore, the equivalent of just under ten million rand, which is many times more than his national contract. But he has yet to spend much of it and he still lives at home. Mpho jokes it may not be for much longer because his parents plan to "soon chase him away". More seriously, Mpho adds, "the lifespan of a professional sportsman is short. He needs to make decisions now that will help him in the future." 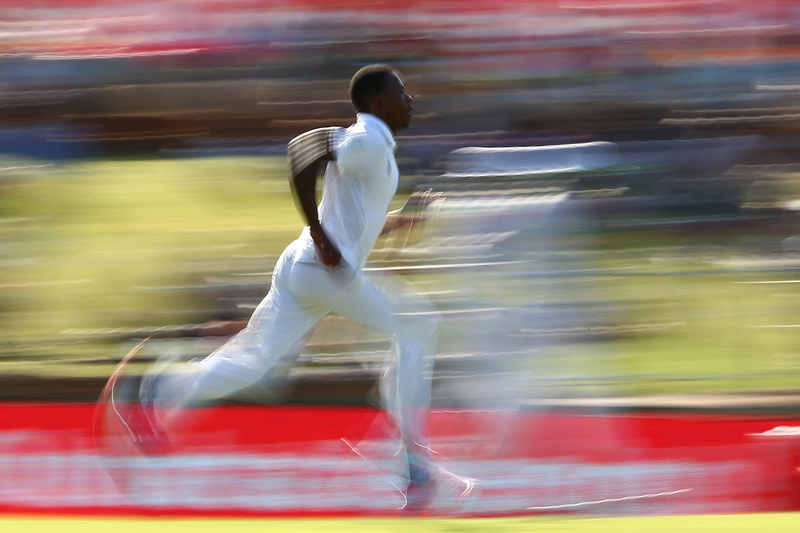 Rabada is "trying to see if there are any business opportunities, trying to crack that code, each and every day". But he is also trying to live his life like a normal twentysomething, who enjoys house music and parties and does not take things too seriously. On that he has his parents' blessing. "The years between the ages of 18 and 24, those are the years in which you should really be discovering things and yourself," Mpho says. "And if you don't, you can never recover those years." Rabada has been to Mauritius on holiday and would like to get to Bora-Bora in the south Pacific, and explore other parts of the world. "I'm just trying to get to know what happened in the past, trying to understand the world, myself, trying to improve my cricket and then see where I am going in my life. And at the same time, have fun." And he is doing all of that while also performing one of the most important jobs in the South African sports landscape: trying to take the national cricket team to new heights. "The team is going through a bit of a transition," he says. "We've got youngsters coming in Lungi Ngidi, Andile Phehlukwayo, Aiden Markram and Wiaan Mulder. It's a very interesting phase. It's almost like this is our generation and we are learning from the seniors but this is going to be our time to take over, not in a hierarchy type of way, just in a sense that we are going to take the team forward now." There will be many photos, many headlines and many scorecards documenting all that.